Cruising Croatia is not just about the ship and its facilities, it is about making the most memorable journey in one of the world’s most popular destinations with amazing experiences. Our vessels cruise during the day providing spectacular views of Croatian riviera, hilly islands and unspoiled nature. Dive in the crystal clear sea during daily swimming stops at secluded bays or at world famous beaches and afternoons dock in new historical towns just waiting to be discovered. Unlike bigger cruise liners that offer limited time in the ports, our vessels dock right in the center of the even smallest places enabling the guests to come on or off the ship at their own will and explore UNESCO protected sites, narrow historical streets or major tourist centers. 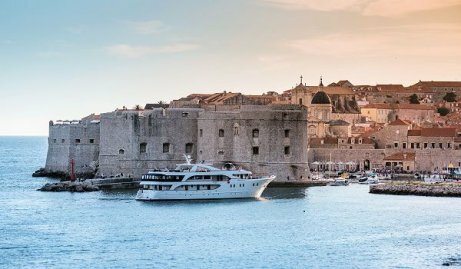 Feel completely at ease and settle in on a journey of a lifetime as you cruise to discover the timeless wonders Croatia has to offer. Deluxe superior is a new class of newer and larger vessels, the best vessels that exist on the Adriatic sea built with high quality materials of solid wood, glass, marble, stainless steel and similar. Minimum 47 meters in length, newly built or refurbished after 2016, with hot tubs and spacious, superbly designed, air-conditioned en-suite cabins with double or twin beds, 15 to 20 meters in size. Cabins are equipped with wardrobes, deposit box, hair dryer, toiletries, bathrobe, slippers etc. Included services: Airport transfers, buffet breakfasts and four course lunches, drink with lunch, Captain's dinner with live music, dinner in a typical Croatian setting, sightseeings, English speaking tour manager, various entrance fees, various tastings, Visitors' tax & port fees, luggage handling, daily cabin service, tea and coffee all day, a liter of water per person daily. Included services: Airport transfers, buffet breakfasts and four course lunches, drink with lunch, Captain's dinner with live music, additional dinner in a typical Croatian setting, sightseeings, English speaking tour manager, various entrance fees, various tastings, Visitors' tax & port fees, luggage handling, daily cabin service, tea and coffee all day, a liter of water per person daily. Included services: Buffet breakfasts, three course lunches, Captain’s dinner, English speaking tour manager on board, three guided tours, daily cabin service, mid-week fresh set of towels and bed linen, luggage handling, olive oil and wine tasting on board, afternoon tea and coffee, a liter of water per person daily. Included services: buffet breakfasts, three course lunches, Captain’s dinner, English speaking tour manager on board (except on KL1 and KL5), one guided tour, daily cabin service, mid-week fresh set of towels and bed linen, luggage handling, olive oil and wine tasting on board, afternoon tea and coffee, a liter of water per person daily. Included services: Continental breakfasts, three course lunches, a liter of water per person daily. All our vessels include a liter of water daily, complimentary Wi-Fi on board, welcome reception and cocktail. Majority of vessels have 18 to 19 cabins on average, excluding traditional vessels which range 10 to 15 cabins. Most vessels have limited third bed possibility. The atmosphere on board of the cruises is informal and relaxed so don’t forget to bring your good mood! In most cabins, you will be able to store your suitcases under the bed in your cabin. Regarding clothes, we recommend you to take lighter clothes including a pair of shorts, a few T-shirts, a swimming-suit, sandals, etc. as well as some clothes for possible cooler evenings (for example some sports fitting, windbreaker or similar). Fishing gear, snorkeling masks, lilos, etc are not available on the ship and therefore we recommend to bring your own or to buy one at places on route. I would just like to tell you thank you. Stacy, my sister Lori & I are sitting outside on the patio of The Garden Hotel in Sienna, enjoying some wine and an incredible view. We have been having such a FABULOUS time. My personal favorite (so far) is Ovierto - the cave tour is incredible. At every hotel, we have been treated so well, and the hotels are terrific. You are definitely in the right profession, you are very good at what you do. Hopefully some day Stacy and I will be able to meet you. I think we have chosen the places to visit and the places to stop (to sleep) very well. The trip was not tiring and each small town has its own charm. Many friends congratulated us on the not so usual itinerary and I was invited to give a lecture on the trip. We really enjoyed our trip and we would like to thank you for all suggestions and the good choice of hotels! Hello Hubertus! This is just a quick note to thank you and to say everything went well, we had no issues during the tour in Spain. We enjoyed our vacation very much.